You are there for everyone else. Whether you’ve been getting everyone settled back to school, shuttling grandkids around, or just working hard, the stress of juggling it all can build up. Even though you may feel fine most of the time, stress can make it hard to think clearly and focus. You may not be able to sleep as well or as long as you need to. Stress can also make you impatient and a little short-tempered—even with those you love. Although removing all the sources of stress in your life might not be possible, here are three easy things you can do to feel calmer and more like yourself again. The first is to take a deep breath and then exhale all the way out. This slows the heart rate and signals to your brain that you’re safe. Repeat a couple of times for renewed peace. Another quick way to relieve stress is to drink a glass of water. Even mild dehydration can make you feel cranky and irritable. Pause for a moment to rehydrate, and you’ll enjoy feeling more calm and flexible. A third easy stress-reducer is to focus your mind. You can decrease anxiety and improve a host of other stress-related issues by spending five or more minutes paying attention to your breath and relaxing your body. Meditation brings you feelings of contentment. Try free apps like Insight Timer and Headspace that offer guided relaxation meditations. Even though stress is part of life, you can do simple things to feel less stressed and more calm. You deserve to enjoy life and feel happy. Since you’re there for everyone else, we’re here for you. 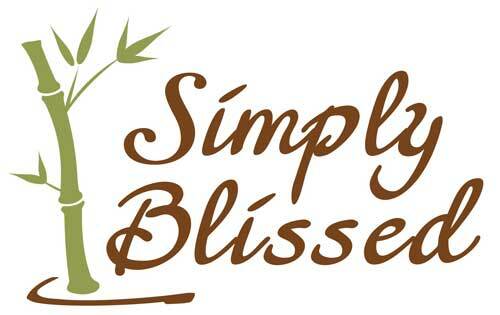 The Simply Blissed massage experience creates a respectful, caring space for you to feel nourished. We include your choice of natural essential oils and focus on your areas of concern. For extra relief of tension, you can even add a five-minute hot stone sampler to your massage when you schedule. Our massage therapists have table time open this month. Experience bliss—book a massage for yourself.